The burden of cerebrovascular disease in developing countries is rising sharply. The prevalence of established risk factors of stroke is exceptionally high in Pakistan. However, there is limited data on the burden of stroke and transient ischemic attack (TIA) in South Asia. We report the first such study conducted in an urban slum of Karachi, Pakistan. Individuals 35 years of age or older were invited for participation in this investigation through simple random sampling. 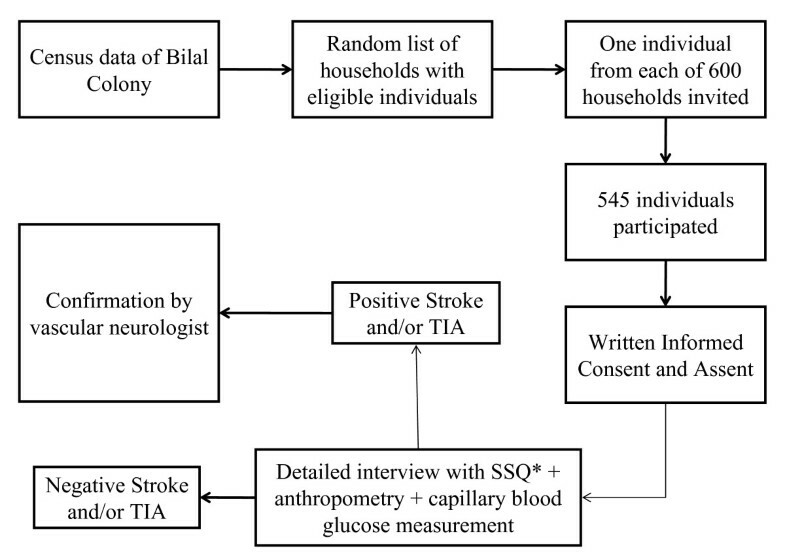 A structured face-to-face interview was conducted using a pre-tested stroke symptom questionnaire in each participant to screen for past stroke or TIA followed by neurological examination of suspected cases. Anthropometric measurements and random blood glucose levels were recorded. Multivariable logistic regression was used to determine the association of vascular risk factors with prevalence of stroke. The prevalence of modifiable risk factors for stroke in the Pakistani population is alarmingly high. Hypertension affects one in three adults aged greater than 45 years and 19% of the population aged 15 years and above The National Health Survey of Pakistan showed that diabetes mellitus is present in 35% of people older than 45 years The overall prevalence of obesity is 28% in women and 22% in men while the prevalence of tobacco use is 33% in men and 4.7% in women[5, 6] Given the wide prevalence of risk factors, the burden of stroke in Pakistan is likely to be substantial. Transient Ischemic Attack (TIA) defines a subset of patients prone to stroke who may benefit from timely intervention. The immediate risk of stroke is about 10% in the first 90 days after a TIA with 50% of this risk in the first 48 hours Data from Pakistan also supports these observations Early intervention after TIA has shown an 80% relative risk reduction in the emergence of stroke in western cohorts[9, 10] This clinically recognizable syndrome is an important pragmatic entry point for stroke prevention in those at highest risk of "conversion"
No multiethnic prevalence studies of stroke or TIA have been reported from Pakistan to date. The present study reports the life-time prevalence of stroke and TIA and their associated modifiable risk factors in a multiethnic urban population. According to a recent census (August 2008) conducted by the same department, the population of Bilal Colony is 76,361 individuals in 10,925 households with an average monthly household income equivalent to $124 ± $93 US dollars. In context, Gross National Income (GNI) per capita per annum in Pakistan is $980 US dollars Urdu, Punjabi, Baluchi and Pushto are the major languages spoken in this multiethnic population and more than 99% people are Muslims. Roughly 50% have received no education while 10% have received religious education only. Census data was used to generate a simple random list of households where individuals above the age of 35 years resided. Community health workers (CHWs, trained volunteers with at least 6 years of work experience in Bilal Colony) visited the selected households to invite eligible individuals for face-to-face interviews. Single individuals from each household who met the inclusion criteria were invited. An additional batch of multilingual community volunteers accompanied the team to provide ease of conversation. Invitations along with an information leaflet were provided at these home visits. All men and women aged 35 years or above who were residents of Bilal Colony for two years or more were eligible for the study. Upon non-availability or refusal by an individual, the next household on the list was approached. Recruitment was continued for a total of 15 days until the targeted sample size was reached. Using a 95% confidence, 5% estimated stroke prevalence reported previously and 2% bounds of error; a required sample size of 457 participants was calculated. Six hundred households were approached during the study period. In order to establish if our sample was representative of the community at large, age and gender distribution of our participants was compared with that of the census data. A study clinic was organized by this project team at the Maternal and Child Health Clinic, Bilal Colony. This clinic was divided into three areas - Interview (Area I), Neurological Assessment (Area II) and Physical Examination, Anthropometry and Measurements (Area III). Logistics were designed to facilitate automatic transfer from Area I through III of each participant. Each participant would register at Area I. After explanation of the study procedure and written informed consent, all participants underwent a structured interview with physicians trained in using a standardized questionnaire. This questionnaire was based on the Stroke Symptom Questionnaire (SSQ) and the TIA Symptom Questionnaire, which was translated into Urdu by three independent translators and a final version was selected after group review The questionnaire was divided into the following sections: 1) socio-demographics, 2) stroke symptoms ever experienced, 3) TIA symptoms experienced in the last 12 months, 4) known risk factors. Pre-testing of the questionnaire was carried out on 35 individuals with a similar age and socioeconomic status distribution as the study population. A copy of the questionnaire can be found here (English: Additional file 1; Urdu: Additional file 2). All participants were shown photographs depicting amaurosis fugax, diplopia, triplopia (triple vision; perception of three images of a single object), hemianopia, hemiparesis and facial paresis as a part of their interview (see Additional file 3). Following the interview, any cases suspected to have had stroke or TIA were examined and confirmed by a vascular neurologist on site (Area II). Stroke and TIA were defined using published criteria[15, 16] Anthropometric measurements and random blood glucose levels using Abbott MediSense Optium Glucose Monitor were recorded in all participants. All instruments used for anthropometric measurements were calibrated on a daily basis. The study protocol was approved by the Ethical Review Committee at Aga Khan University. Informed consent and verbal assent was given by all participants prior to the interview. Participants who met the eligibility criteria but were unable to travel to the study site due to financial or physical reasons were provided transport. Interviews were also conducted on holiday weekends to ensure the participation of daily wage workers without any financial repercussions. No financial incentives were provided to any study participant. An overview of the study design is presented in figure 1. Overview of the study design. *SSQ = Stroke Symptom Questionnaire. A total of 545 individuals including 49.4% females took part in the study with a response rate of 90.8%. As compared to the community census data of individuals older than 35 years, we had a slightly higher proportion of females in our sample (49.4% in this sample v/s 43.9% in the census, p = 0.012). The mean age ± standard deviation (SD) of responders was 48.7 ± 12.8 years while that found in the census data was 46.6 ± 11.1 years (p < 0.001). Characteristics of the study population have been described in table 1. Stroke was reported in 104 individuals (19.1% with 69.2% female) while TIA was reported in 53 individuals (9.7% with 69.8% female). Overall, stroke and/or TIA were found in 119 individuals (21.8% with 66.4% females). 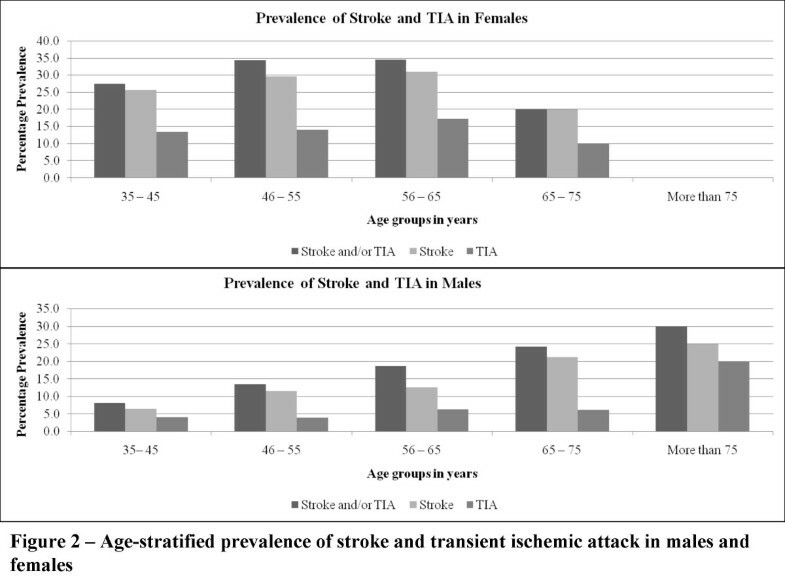 The prevalence of stroke and TIA across gender, age groups and ethnicities has been shown in table 2. Age-stratified prevalence of stroke and TIA in males and females is presented in figure 2. Age-stratified prevalence of cerebrovascular disease in males and females: the life-time prevalence of CVD in females was similar in all age groups (p = 0.611) while that in males rose with old age (p = 0.025). *TIA = Transient Ischemic Attack. Female gender (p < 0.001), family history of coronary artery disease or stroke (p = 0.013), elevated random blood sugar (p = 0.004), hypertension (p = 0.002), body mass index ≥25 kg/m2 (p = 0.006) and past history of myocardial infarction (p = 0.023) were significantly associated with risk of stroke and/or TIA on univariate analysis. In the multivariable model, old age, female gender, family history of coronary artery disease or stroke, elevated random blood sugar and use of chewable tobacco products were significantly associated with risk of stroke and/or TIA. Univariate and multivariable analysis of risk factors is presented in table 3 and table 4 respectively. Risk factor profile and non-adjusted Odds Ratios for stroke and/or transient ischemic attack. Note: WHR - Waist-hip Ratio, BMI - Body mass index, RBS - Random Blood Sugar, CAD - Coronary Artery Disease, BP - Blood Pressure, SD - Standard Deviation, TIA - Transient Ischemic Attack, CI - Confidence Interval. aGiven as n(%) except where stated specifically. bCalculated for each 5 unit increase. cDefined as systolic BP greater than or equal to 140 mmHg or diastolic BP greater than or equal to 90 mmHg on two readings at least 10 minutes apart and/or self-reported history of persistent hypertension. dRaised Random Blood Sugar level greater than or equal to 180 mg/dL on one reading. ePan, gutka and supari are locally available forms of chewable tobacco. fDefined as body mass index more than or equal to 25 kg/m2. gDefined as waist-hip ratio greater than 0.88 in males and 0.81 in females. hMenopause was considered in the female subset of our sample only. Results of multivariable analysis of significant risk factors for stroke and/or transient ischemic attack. Note: RBS - Random Blood Sugar, CAD - Coronary Artery Disease, BP - Blood Pressure, SD - Standard Deviation, TIA - Transient Ischemic Attack, CI - Confidence Interval. Variables biologically plausible or significant at p < 0.100 on univariate analysis were included in this model. bDefined as systolic BP greater than or equal to 140 mmHg or diastolic BP greater than or equal to 90 mmHg on two readings at least 10 minutes apart and/or self-reported history of persistent hypertension. cRaised Random Blood Sugar level greater than or equal to 180 mg/dL on one reading. dDefined as body mass index more than or equal to 25 kg/m2. Of the patients who reported stroke or TIA, 7% reported residual disability (Modified Rankin Score2-4) whereas 93% were symptom-free (Modified Rankin Score 0). This study is the first urban population based estimate of life-time prevalence of cerebrovascular disease in Pakistan that shows an alarmingly high burden of disease. In comparison to existing worldwide literature on stroke prevalence, this study shows a prevalence of stroke which is almost twice the highest reported prevalence in the world to date (table 5)[17, 18] A prior study reported a stroke prevalence of 4.8% in a single ethnic group in Pakistan However, the definition of stroke used in this study was limited to the presence of sustained hemiparesis for more than 24 hours. Given the wide variety of presentations of stroke, it is likely to be an underestimate of the true burden. In comparison, we report about 1 in 5 people in our sample have suffered from stroke or TIA. In addition, our data also suggests that patients who have suffered from stroke in Pakistan have an average age of about 50 years which is almost a decade younger than their western counterparts. A previous study from Pakistan has reported about 25% prevalence of coronary artery disease in a middle-aged sample Hence, our results reiterate the exceptionally high burden of atherosclerotic diseases in Pakistan. In addition, family history of coronary artery disease increased the risk of stroke and/or TIA by at least 32% in our sample. These findings highlight the shared genetic and environmental etiologies that may have a role in atherosclerotic vascular disease in the South Asian population. Crude prevalence was determined to be 19000 per 100,000. Women found to have a higher prevalence of stroke and at an earlier age than men. We further suggest that females are at a higher risk of stroke and/or transient ischemic attack in our population and this finding is independent of all other risk factors. Females were well-represented in this sample as the study site was visited by women frequently and they did not require male chaperones to participate in the study. Hence, the design of this study ensured appropriate participation of females, a usually under-represented group. Hypertension was found in about 50% of all participants while increase in each 5 mmHg of systolic blood pressure significantly increased the risk of stroke and/or TIA by at least 2% on univariate analysis. Hypertension, as defined by elevated systolic or diastolic blood pressure or self-reported past medical history of hypertension, was significantly associated with stroke and/or TIA on univariate analysis but did not reach statistical significance in the final adjusted model. About 57% of the participants were obese with body mass index ≥25 kg/m2 and obesity increased the risk of stroke and/or TIA by at least 19% on univariate analysis. We confirm the association of known modifiable risk factors with cerebrovascular disease in Pakistan. Similar reports of high burden of cardiovascular risk factors have been published earlier [4–6] Our data also shows that only 19% of stroke patients in this study were aware of their condition while about 58% of all participants with elevated blood pressures were aware that they had hypertension. These findings highlight the need for community education about modifiable vascular risk factors. They also call attention to the role that general practitioners can play in our setup through promotion of lifestyle modifications and through aggressive therapeutic control of diabetes and hypertension in order to lower the risk of stroke and TIA in the community. The strengths of this study include standardization using a pre-tested questionnaire, on site verification of diagnosis by a vascular neurologist, a random sample from a multiethnic population and appropriate arrangements for representation of women and daily wage workers. The use of a combination of questions to assess stroke and TIA prevalence has been shown to improve sensitivity at the risk of false positives We also used photographs of the experience of visual symptoms of stroke and TIA to assist in clear diagnosis. For example, participants could clearly identify historically whether they had "non-specific clouding of vision" vs. "hemianopia" by looking at a photograph depicting hemianopia. While this approach may have increased the specificity of the visual section of our questionnaire, we have not measured this effect. Our sample size may have limited power to study independent associations with all possible risk factors. We were unable to confirm an association with smoking perhaps because the population prefers indigenous means of tobacco intake over cigarette smoking. As compared to the census data, mean age of our sample around two years greater and we had a slightly higher representation of females. However, the prevalence of vascular risk factors in our sample is similar to that reported earlier in literature. Hence, we believe that the findings of this study are reliable and a call for action. Since the site of the study was located in an urban slum of Pakistan with a predominantly low socioeconomic status, the results of this study may not be completely applicable in the rural areas of the country where the prevalence may be lower as "demographic transition" may not have occurred. However, they may be applied in similar socioeconomic strata in Pakistan. We report an alarmingly high burden of stroke and TIA in the urban Pakistani population. Our findings mimic the reported prevalence of cardiovascular disorders and their risk factors in Pakistan[4, 19] The association of female gender and local chewable tobacco use with stroke begs further investigation. Community awareness about stroke and its modifiable risk factors was limited. Individual and public health interventions in Pakistan to increase awareness of stroke, its prevention and therapy are warranted. This study was funded by the University Research Council at Aga Khan University Grant Number: URC Project ID 07GS021MED. This is part of the "small grants program". Ayeesha Kamran Kamal, Ahmed Itrat contributed equally to this work. We wish to acknowledge Dr. Zulfiqar Bhutta (Professor and Chair, Department of Pediatrics and Child Health, Aga Khan University Hospital) for his facilitation of this study and provision of census data, Dr. Hafeez ur Rahman Bhutto for site management, Mr. Imran Ahmed for responding to data queries specific to Bilal Colony, Ms. Shahida Parveen for assisting with multilingual translations, Dr. Mughis Sheerani for facilitation of resident participation, and finally the community health workers and the community of Bilal Colony. AK conceived the study, supervised data collection and wrote the manuscript. AI performed study coordination, field management and was involved in all stages of the project including writing the grant. MM, MK, AR, AA, AA, ZA, NI, SS, FM performed field work, manuscript writing and data entry. MM and AI performed statistical analysis. DS generated a randomization list and provided statistical overview. All authors have read and reviewed the final manuscript.